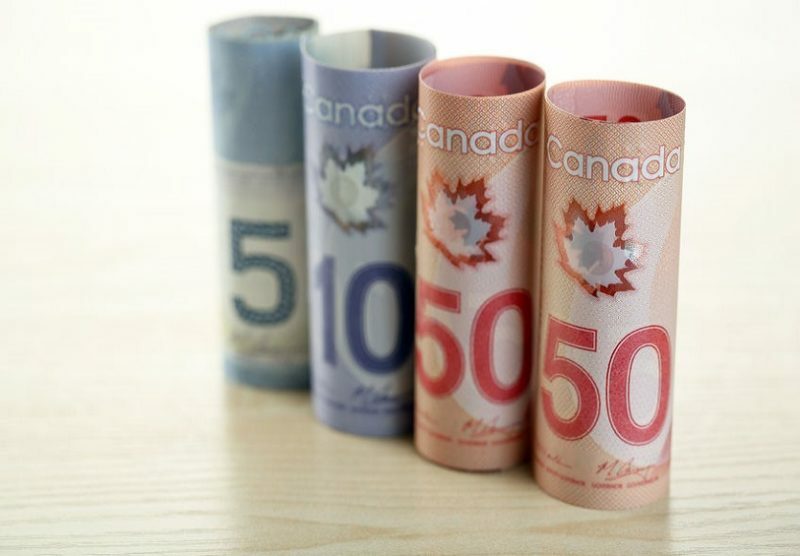 Home » Canada Pension Plan – When should I start to take my payments? The Canada Pension Plan (CPP) is an important source of income for many Canadians aged 60 and older. Canadians with employment income, even if self-employed, generally pay into the program until the earlier of their retirement or age 65, and they can choose to begin taking monthly payments any time between ages 60 and 70. The payment entitlement at age 65 is considered the baseline. Choosing to begin taking monthly payments at age 60 results in a considerably smaller amount, 64% of the baseline amount, and delaying payments until the age of 70 yields the highest monthly payment, 42% larger than the baseline. The payments are always fully taxable as income, and are indexed to inflation, so their value should not be eroded by inflation over time. In real dollar figures, the maximum age 65 amount a person can receive monthly is currently about $1,150, or around $13,800 per year. Each person’s entitlement amount is based on how many years that person worked in Canada, and her or his income in those years. In general, you need to have earned at least $55,000 (in 2019 dollars) for 35 years or more to get the maximum entitlement, after adjustment for time off for childcare and other factors. In fact, the vast majority of Canadians don’t get the maximum CPP payment. The average monthly payment is about $640 per month or $7,700 per year – a little more than half the maximum. When to take CPP is an important decision, and in making the decision there are a few factors to consider. First, what is your financial situation? If you are barely making ends meet, then taking payments earlier is more attractive, while if you have more than enough to get by, you should instead be more interested in maximizing your lifetime benefits. Second, what is your life expectancy? If you’re in excellent health with a family history of longevity, you have a longer expected window of payments which affects how you should optimize your decision. Third, if you’re not putting the CPP payments towards your expenses, what kind of investment return do you expect? If the expected return is higher, then earlier withdrawals have the ability to be invested and compound at high growth rates, making earlier withdrawals relatively more attractive. If you expect to use the CPP payments to help you with your lifestyle expenses, the determination comes down to two things. First, your life expectancy. If you are in poor health, it is probably beneficial to begin payments earlier to ensure you get some benefit out of the plan. Second, your ability to make do with your existing funds to reap the benefits of a larger payment down the line. 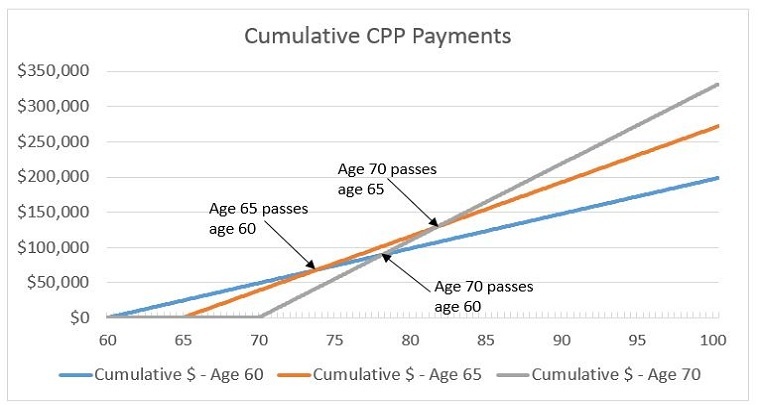 You can see in the chart below that for a person living until at least the age of 73, taking CPP at age 60 results in lower lifetime payments than deferring payments until age 65. If one waits until 70 to take payments, and lives until at least age 78, the lifetime benefits will exceed those received by taking payments at age 60 or age 65. Life expectancy in Canada has increased steadily over the last forty years. If you are 60 years old today, you will live for 25 more years, on average, based on the 2016 Canadian mortality tables. As a result, if you’re in average or better health you will be better off waiting as long as possible to take CPP. However, this might not be possible if you’re struggling to make ends meet, in which case taking the payments as soon as possible may be the best course of action. Essentially, the longer you can wait, the better. If, on the other hand, you have sufficient income from other sources and you’ll be investing your CPP payments, then another factor that affects your decision is the expected rate of return you’ll earn on your investments. If you assume a higher rate of return, then the breakeven points are pushed further into the future, since payments received earlier can compound and grow for a longer time. If you assume a lower rate of return, then the breakeven points are closer to the spending case above. In a base case, assuming a 5% investment return, a general recommendation would be to take CPP at 65. As you can see in the chart below, taking payments at age 65 rather than age 60 results in a bigger portfolio – total payments plus interest earned – at age 79. However, taking payments at age 70 doesn’t result in a bigger portfolio than taking at age 65 until age 93. And as we noted before, a person’s expected longevity has a direct impact on the total payments they’ll receive. 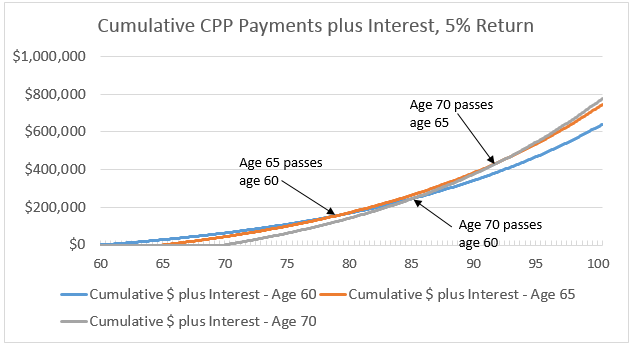 The recommendation for average 60-year-old who doesn’t need the extra cash from the CPP would, in general, be to take payments starting at age 65. Overall, it is a strong compromise: most reasonably healthy 60-year-olds will live past 79, so they’ll generally beat a strategy of taking payments as soon as possible. As well, while some who will live into their 90s and beyond will leave money on the table, starting at 65 ensures a fair trade-off between these two factors. While this information should be useful for the average Canadian, I haven’t yet had the pleasure of actually meeting an “average Canadian”. Every person is different, with different needs, objectives, goals and attitudes. The pension entitlement you may have from employment, the pension entitlement of your spouse, the amount of income from other savings and your tax position all will have an impact on your decision. A healthy financial perspective requires analysis customized to the individual. If you’re interested in learning more about a holistic view of your personal portfolio, please get in touch. We are pleased to now offer financial planning at no charge as part of our services.